Twice during my career, I’ve jettisoned the 9-5 world for the independence and flexibility of freelancing. Twice I’ve had to face the pitfalls of being my own boss: the long hours searching for clients, the pulsating pressure of an hour to go before deadline while my husband is asking me how to make soup, and no colleagues down the hall to vent my troubles to or talk about the latest episode of Mad Men. But one pitfall I hadn’t anticipated was how easily this new stress could take down my health and, if I wasn’t careful, render me pretty much useless to my clients. If you’re new to freelancing, want to work for yourself, or even are a seasoned pro, watch out for these common health traps. 1. Don’t just sit there. Chances are, you did a lot of walking at your old job, and maybe not so much now that you’re working from home. Bodies were made to be in motion, not sitting in cramped positions for hours at a spell. Prolonged sitting, especially in an uncomfortable chair (more on that later) can lead to back and neck problems. Set an alarm if you need a reminder to take regular breaks. Or find some work tasks you can do standing up. I proofread standing up, and look upon it as a welcome break from sitting. 2. Get out of the house once a day. Even though my husband also works from home, I have to bust out once a day, otherwise I start to feel claustrophobic and “outside” of the real world. I’m much more efficient if I’ve had this break, even if it’s only a short walk around my neighborhood. 4. Get enough sleep. Say you’ve underestimated the time you’d need to finish a project, you’re facing down a wicked deadline and now you’re looking for things you can put off to give yourself extra time. Cut out Conan or Dave, but don’t cheat yourself on sleep. You won’t be the sharpest pin in the voodoo doll the next day, and mainlining Starbucks will only make it worse. 5. 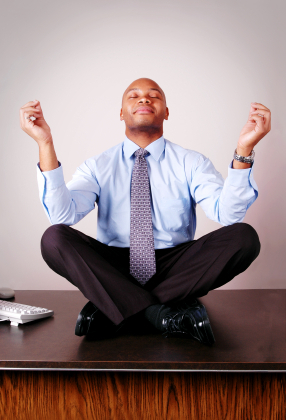 Develop a stress-management practice. I like deep breathing. It only takes a few minutes a day, and for me, it’s a reminder to slow down and pay attention to my body. You might like meditation, yoga, or taking your dog for a long walk. Whatever relaxes you (and gets you away from the computer) is best. If you let that stuff build up, it’s like poison. 6. Keep your kitchen stocked with healthy food…where you can see it. It’s so tempting to take a break from a less-than-exciting task (data entry, ick!) and sneak down to raid the pantry. No wonder so many freelancers put on a few pounds at the start. But if there’s a bowl of fruit on the table, or a dish of cut-up veggies in the fridge, you’ll be more likely to grab those than the cookies your significant other insists on keeping in the snack drawer. 7. Get ergonomic. It’s vital to your health and productivity to design a workstation that is efficient and suited to your particular proportions. After your computer and your health insurance (you do have health insurance, don’t you? ), your next largest expense should be your office chair. You don’t have to spring for Herman Miller’s latest Aeron, but you need something that’s adjustable and has a good lumbar support. As my physical therapist (to whom I’ve given lots of money because I spent a lot of years in lousy chairs) says, “Your chair should fit your body like a good shoe fits your foot.” Also, put the things you use regularly within easy reach to avoid repetitive strain. And, if I ever see you cradling that phone between your ear and your shoulder, I will come down there and give you a time-out. Don’t think I won’t, either. What about you? If you work for yourself, what strategies do you use to stay healthy? I teach private voice/piano lessons out of my apartment right now, and I make sure that I try to get out of my home at least one time during the day. Luckily for me, I am involved with community theatre at night, which really exercises my social muscles and pushes me to interact with others. Otherwise, I’d be completely indoors during the day…something that makes me develop cabin fever like you wouldn’t believe! I’m digging your site…great post! Thank you, Auntbethany! Sounds like you’ve got a good balance of activities. I’m saving up for a special chair that accommodates shrimpy types like me. I find most chairs have such deep seats, my legs literally stick straight out (no joke) when I sit all the way back. I wind up sitting on the edge of my seat while writing, which would be wonderful if I were writing some really exciting scenes! Either way, I must get up several times an hour or else my feet, legs and rump fall asleep. I find the snoring terribly distracting. Great post and advice yet again, my sis from another miss! Hah hah hah! Thanks, Jen! I saw one of those chairs in the catalog I ordered mine from. I thought about getting one, cause I have such little short legs, but on the advice of the salesdude, I got mine, and I can sit with my back pressed into the lumbar support and my feet flat on the floor. Totally worth it! Oh-oh-oh which catalog was it, if you mind my asking? Let me check with my PT and get back to you. I’ll be there Tuesday, or Thursday at the latest. Hey, no rush! (where the hell am I goin’ anyhow?) Thanks! !